AAP supremo and Delhi’s Chief Minister Arvind Kejriwal has now issued an apology to Shiromani Akali Dal’s General Secretary Bikram Majithia, for wrongfully defaming him. 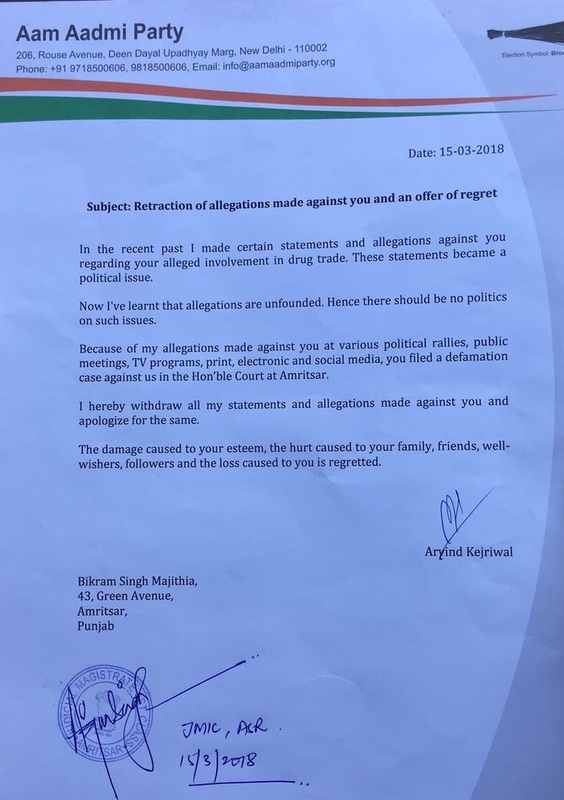 As per an apology letter shared by Delhi MLA Majinder S Sirsa, Kejriwal has issued the apology for wrongly alleging that Majithia was involved in Punjab’s drug trade. Majithia who used to be the revenue minister of Punjab, had filed a defamation case in 2016, against AAP leaders like Kejriwal, Sanjay Singh and Ashish Khetan who had targeted him regarding the state’s drug issue. As a result of which, charges under section 500, 501 and 34 pertaining to defamation were filed against the said leaders. The hearing of the defamation had also seen Kejriwal having to appear in the court. The attack by Kejriwal was so brazen that reports had quoted him as vowing to drag Majithia (by the collar) to jail for his alleged involvement the “multi-million rupee drug racket”. As seen in the letter undersigned by Arvind Kejriwal, and written on an Aam Aadmi Party letterhead dated 15th March, the AAP supremo is seen retracting allegations against Majithia and offering regret. In the letter’s body, Kejriwal is seen recalling the allegations he made regarding the Akali leader the latter’s involvement in Punjab’s drug trade, which escalated into a political issue. Kejriwal then mentioned the defamation case filed as a result of these allegations made in print, electronic and social media platforms. The Delhi CM then claimed that he has now learnt that the allegations are unfounded. He thus proceeded to withdraw all allegations and statements made against Majithia and also tendered an apology. Finally Kejriwal “regretted” the damage caused to Majithia’s esteem, and the hurt caused to the family and followers of the Akali leader. Incidentally this isn’t the only time Kejriwal has chosen to take an apology route to wiggle out of a defamation case filed against him. We had reported last August how Kejriwal, who back then had at least 11 defamation suits against him, had chosen to apologise to try and end one of them. That case in question was filed by a BJP MLA from UP Avtar Singh Bhadana, for a statement Kejriwal had made in 2014 accusing Bhadana of being one of the most corrupt persons in India. The National Democratic Alliance (NDA), a 20-party coalition is fighting the 2019 Lok Sabha elections under the leadership of Prime Minister Narendra Modi.